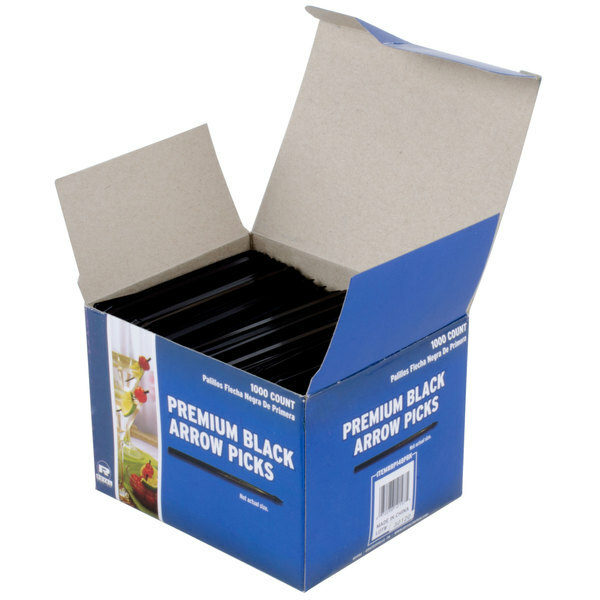 A staple of sandwich shops, casual restaurants, and bars, this heavy-duty Royal Paper RP148PBK 3 1/2'' plastic arrow food pick provides a classic, decorative touch to any number of your most popular menu options. With a durable construction and tip point, you can spear sliders, stuffed mushrooms, or mini meatballs for easy-to-grab individual portions. 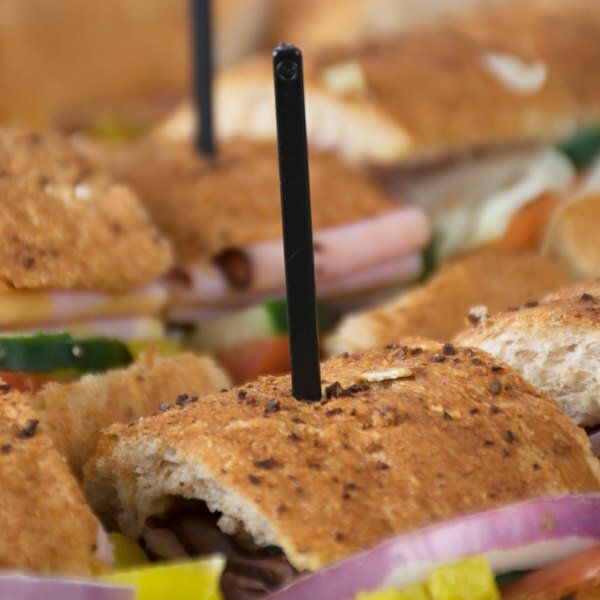 Plus, the pick's 3 1/2" length will allow your guests to easily hold their serving. 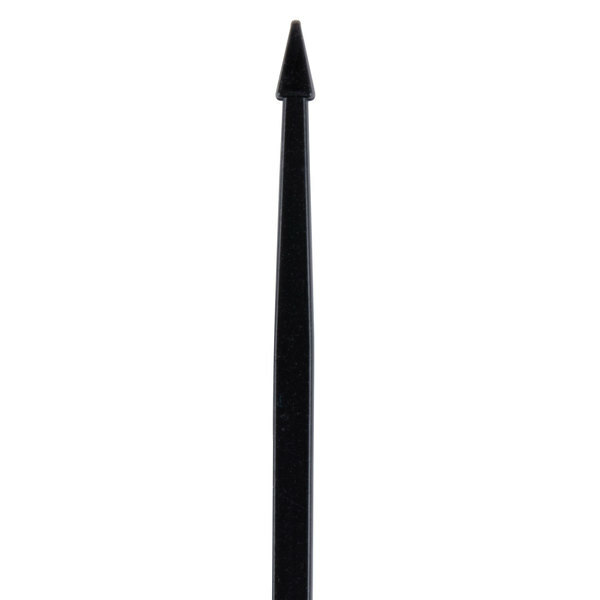 The pick's elegant black color will accentuate your dishes and dinnerware. Its traditional design will also add a decorative finishing touch to your foods. Use this heavy-duty black pick to hold sandwiches together or garnish drinks for a professional presentation that is both functional and pleasing! Once your guest has finished their meal or drink, the pick is disposable so you can simply throw it away. Very sturdy picks at a value price. We use these for our drink garnishes. They work perfectly and hold up to the weight of some of the heavier fruits. Its perfect for bloodies, old fashions and more. Add a pickle, cheese and beef stick or olives and maybe a few cherries. It can hold the weight and spice a drink up. I use these for appetizers and they have yet to disappoint. I have also used them as sandwich picks and they look great! No chipping or melting. We use these to garnish drinks and cocktails. When we throw a cherry on a Shirley Temple or a Manhattan we put it on a pick for a nice touch. Great picks. I use them for garnish on drinks and also use them for food. They work excellent and you get such a large amount. We use these picks in all of our sandwiches. They hold everything together well and are durable. A few years ago we used the slightly thinner kind, there is a big difference. These are quality items, good price and we've used them in our lakeside bar and restaurant for the last 2 years and will continue going forward. We use these for our sandwiches and they look great! 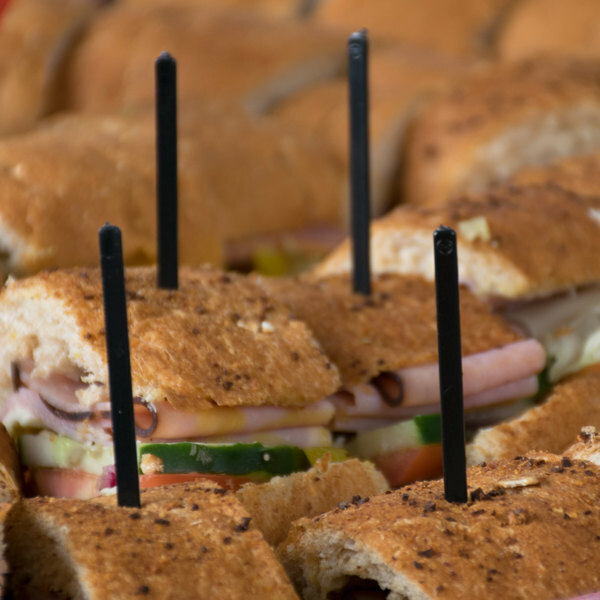 Makes our sandwiches look a little more upscale compared to the frilled toothpicks! Very strong too! We had been using the old plastic swords for our bar garnishes for as long as i can remember. These are a nice update and complete the professional appearance of our cocktails. We used these at one of our catering functions at a local arms museum and needless to say they were a hit! The customers and staff absolutely loved the little touch these provided! These are wonderful. We use these for weddings and can not imagine using anything else. We have never had any complaints about these. They are priced great for the quality and amount. Plastics sticks with a pointy end. Not much else to say but webrestaurant.com seems to ship fast and easy. Great service and products so far.